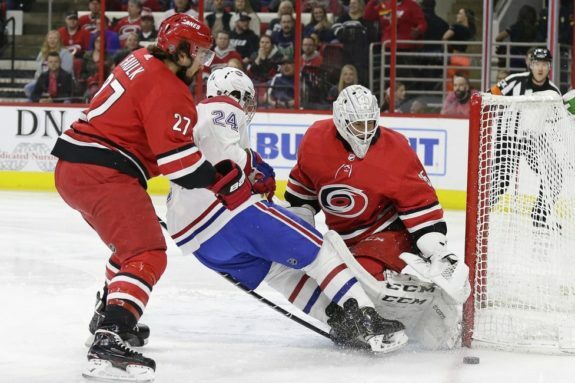 RALEIGH, N.C. — Andrei Svechnikov scored with 1:45 left in overtime as the Carolina Hurricanes rallied to beat the Montreal Canadiens 2-1 Sunday night in a matchup with Eastern Conference playoff implications. Carolina’s Trevor van Riemsdyk scored the tying goal with 5:39 remaining, and Svechnikov ended it with a wrist shot in the extra session. Curtis McElhinney stopped 28 shots. With the win, Carolina remained alone in the first wild card spot in the Eastern Conference. Montreal squandered a chance to move into a tie with Carolina with a win. Paul Byron scored in the first period, and Carey Price stopped 38 of 40 shots as Montreal had its three-game winning streak snapped. Montreal controlled play most of the way before a sudden turn in the final minutes. The Canadiens got the scoring started when Brendan Gallagher fired a shot from the left faceoff circle that was deflected by Teuvo Teravainen. But the rolling puck went straight to Byron along the far post, and he buried it. The Canadiens had other chances, too. Jeff Petry hit the post in the first period, and in the second, Tomas Tatar also hit a post. Jesperi Kotkaniemi had a breakaway denied by McElhinney and Nate Thompson’s point-blank shot in the crease after a turnover was stuffed by McElhinney, as well. The Hurricanes didn’t get their first shot on net in the second period until there was 5:27 left. They Hurricanes finally put pressure on in the third period, but couldn’t solve Price. Sebastain Aho was robbed of two prime scoring chances, and Teravainen couldn’t convert a breakaway with just under nine minutes remaining. But just when it looked as if Price was headed to a shutout, van Riemdsyk sent a wrist shot from the point through traffic that found the bottom left corner of the net. It was a critical goal from an improbable source in van Riemsdyk, who scored for just the third time this season. There was back-and-forth play at the start of overtime before the Hurricanes settled in and held possession. After jumping off the boards in a line change, Teravainen took a pass from Jordan Staal and whipped it under Price, giving Carolina a crucial win as it seeks to end its nine-year playoff drought. NOTES: The Hurricanes improved to 11-3-1 in the second game of back-to-backs this season. … Price was starting on back-to-back nights and for the third time in four days. … The game was broadcast on Canada’s Aboriginal Peoples Television Network in Plains Cree, the first time an NHL broadcast has aired in the Indigenous language. Canadiens: Host Florida on Tuesday. Hurricanes: At Washington on Tuesday.